K-pop boy group EXO will release a live album on Dec. 22, according to its agency on Wednesday. The album was recorded at its concert “EXO from. EXOplanet #1 -- The Lost Planet -- in Seoul,” which was held at the Gymnastics Stadium at Olympic Park in Seoul in May. It will also include the new winter-themed song “December, 2014 (The Winter’s Tale).” The song will be inserted in the mobile rhythm game “Superstar SMTOWN” on Dec. 19, three days before the album release. 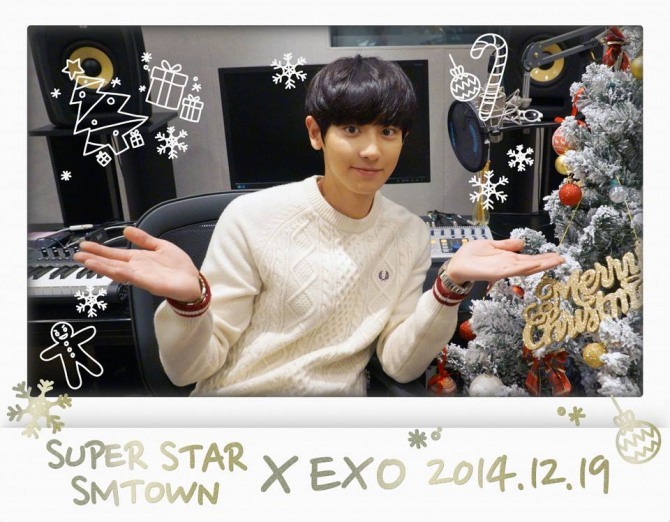 The group’s agency, SMTOWN, uploaded a message on its official Facebook page on Wednesday that read “X-Mas Gift From EXO x SUPERSTAR SMTOWN December, 2014 (The Winter’s Tale) 2014. 12. 19” along with a photo of the group member Chanyeol. The 10-member group will perform in Osaka, Japan, from Dec. 22-24.